From a beautiful tradition, to an idiosyncratic new library! 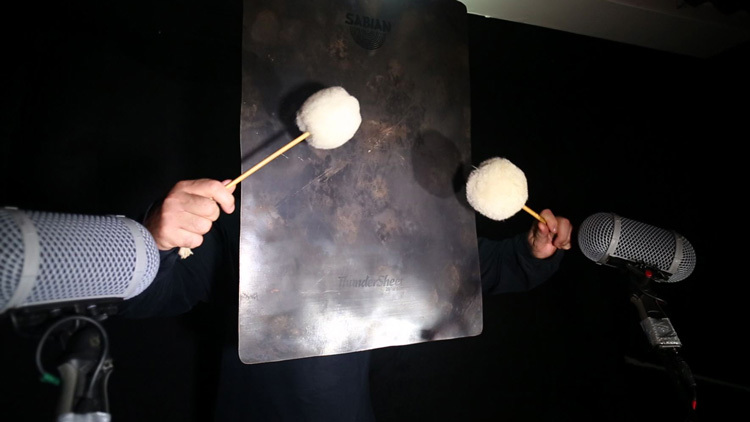 While the Thunder Sheet has been used evocatively in classical music and theatre for eons, we decided to explore what was possible for use as source material for contemporary sound design, first with a hefty Sabian bronze thunder sheet and then veering into DIY territory. And… I now appear to own fourteen thunder sheets! The smallest three are brass and are very zingy as per the FFTs above. 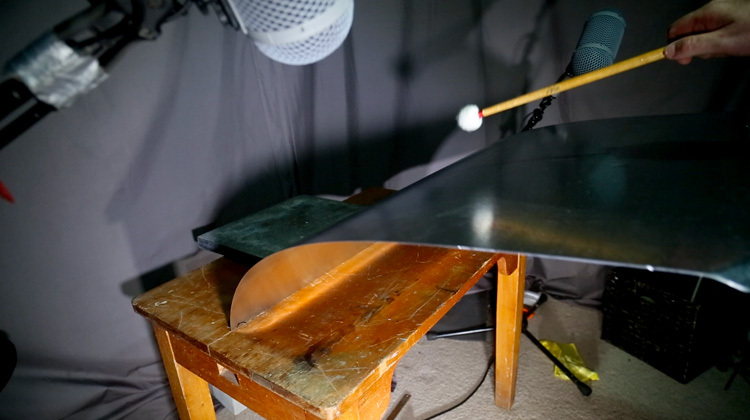 The largest steel sheet creates epic reverbant booms, but with unusual sounding harmonics… Each thunder sheet revealed its sweetspots, with some materials and gauges moaning & then screeching when a friction mallet was used, others warping and inverting with beautiful pitch bends… Meanwhile the plastic sheet has a weird tonality all of its own! 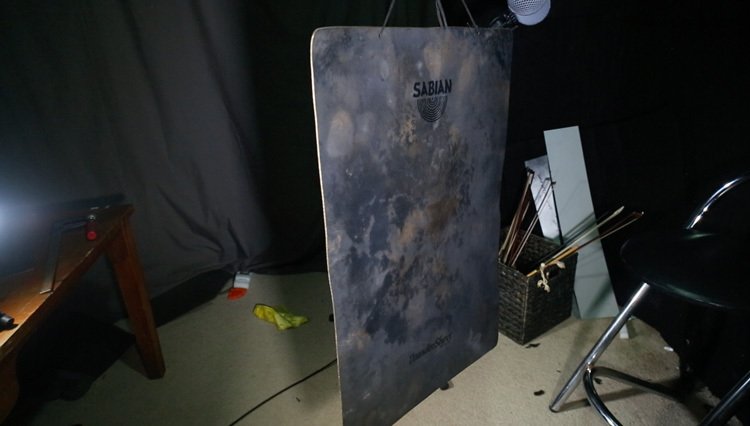 So our firat reference was a large bronze Sabian Thunder Sheet, measuring 50cm x 76cm (20″ x 30″) and quite hefty. 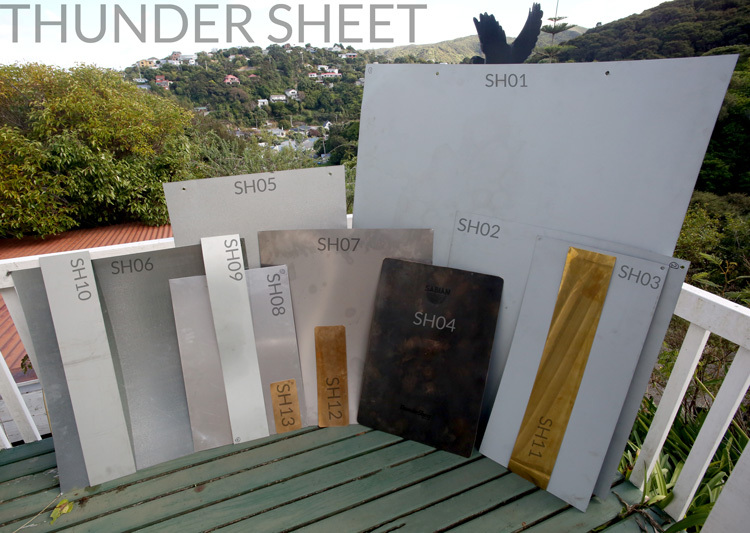 Next we visited local sheet metal company, Kia Ora Sheet Metal in Wellington and auditioned materials, eventually buying the largest resonant sheet steel that we could fit in the car, as well as a range of smaller shapes and sizes… After experimenting with these, we pursued other grades and mediums of metal sheet – aluminium, stainless steel & bronze, thanks to Brocklebys in Lower Hutt. 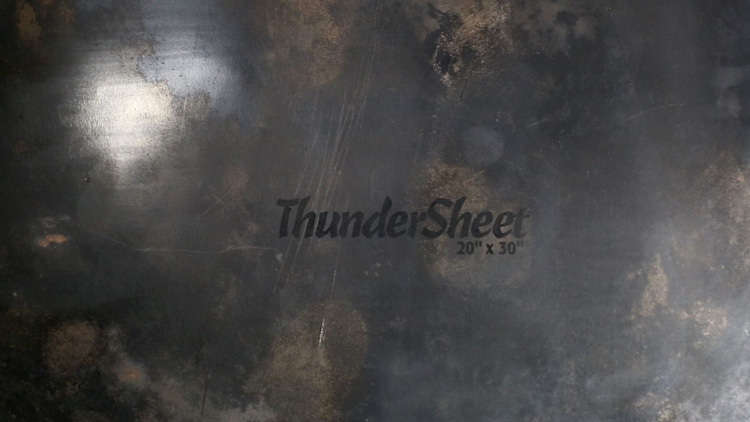 Last we ordered in two tiny thunder sheets, made from an extremely flexible bronze alloy. 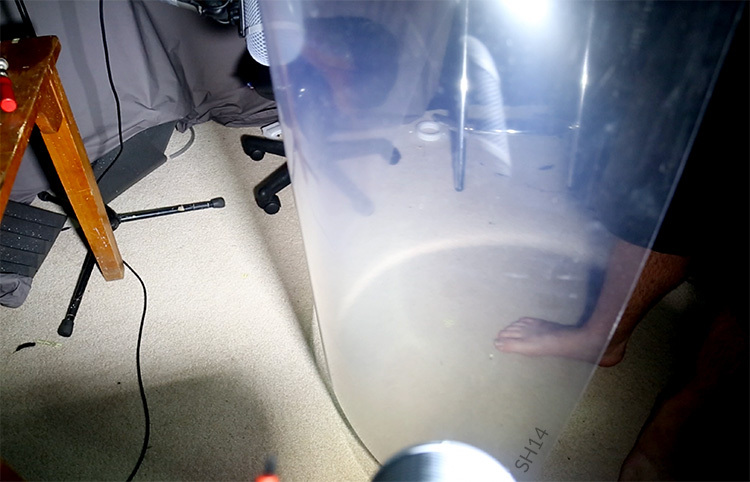 The final contender we stumbled upon in the local hardware store, a one metre square plastic sheet. 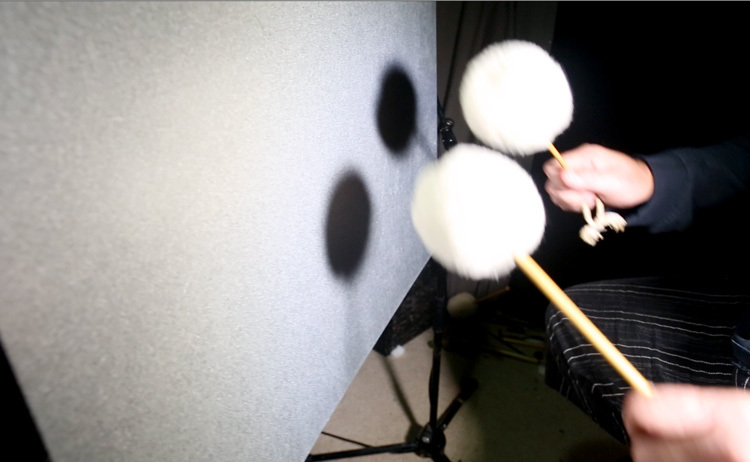 Now the fun began, exploring what was possible with these physical devices, at first playing them as though they were a gong, then physically manipulating them. From one sheet to the next the resonance & harmonics varied greatly, as did the ‘warpability’ factor. 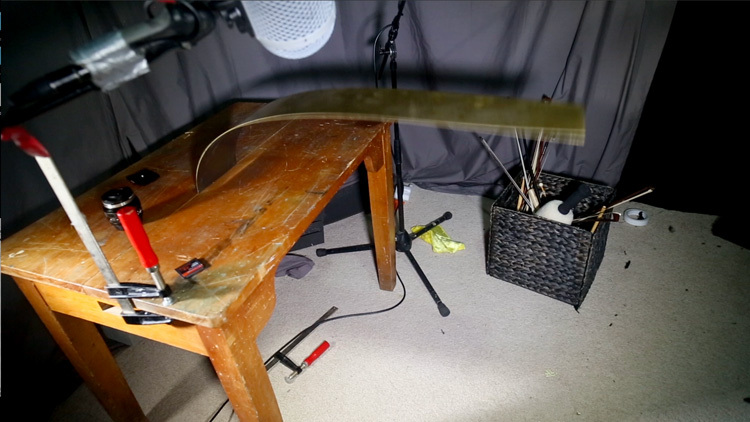 Recording sessions alternated between hanging the metal sheets and directly manipulating them freehand. 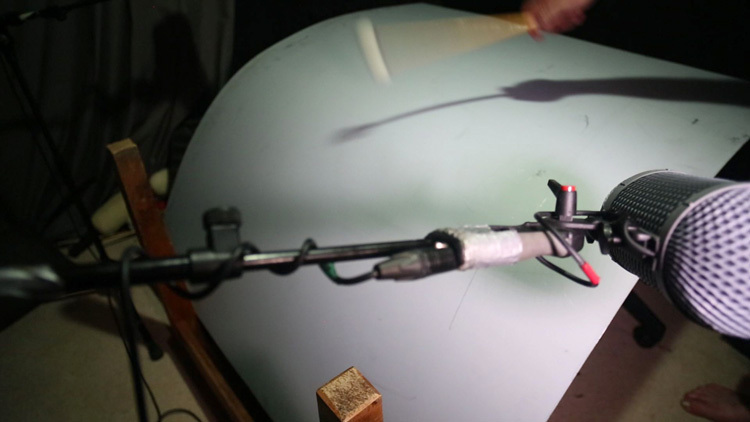 Beautiful huge reverbant hits & rolls were captured with a range of mallets, with some of the soft mallet hits on the largest steel sheet sounding like distant explosions, while some very interesting & uniquely characterful sounds were achieved via warping, bending and inverting the tension across each sheet. 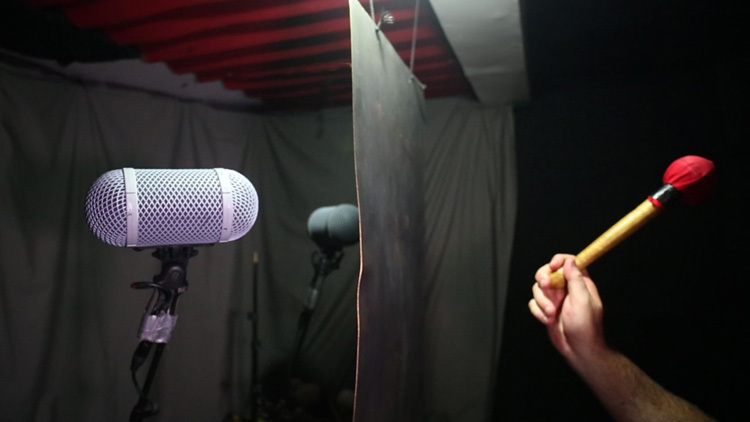 All recording involved a pair of spaced MKH8020 omni mics (10Hz-60kHz) at 192kHz to capture the fill richness of tone (and at times strange harmonics) as well as the extremities of the upper and lower frequency range. 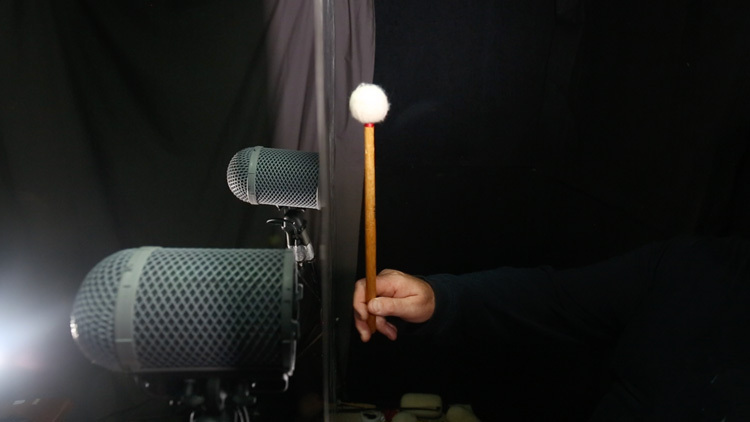 A deep part of our exploration for this library was also inspired by the incredible kinetic sound art of a true New Zealand pioneer, kinetic artist Len Lye. Any NZ visit really should include the Len Lye Gallery in New Plymouth!